Scientists studying high-resolution images from NASA's Mars Global Surveyor spacecraft have concluded there is no evidence of shorelines that would have surrounded oceans that may have once existed on Mars. One argument that such a body of water once existed was suggested by features in images from the NASA Viking missions taken in the 1970s, which were interpreted by a number of researchers as remnants of ancient coastlines. 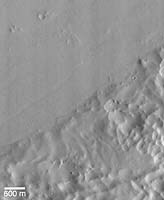 The images from Mars Global Surveyor, taken in 1998, have a resolution five to 10 times better than those that Viking provided. With this closer inspection, none of these features appears to have been formed by the action of water in a coastal environment. "The ocean hypothesis is very important because the existence of large bodies of liquid water in the Martian past would have had a tremendous impact on ancient Martian climate and implications for the search for evidence of past life on the planet," said Dr. Kenneth Edgett, a staff scientist at Malin Space Science Systems (MSSS), San Diego, CA, the institution that built and manages the Mars Orbiter Camera onboard the spacecraft. "The newer images do not show any coastal landforms in areas where previous researchers --working with lower resolution Viking images -- proposed there were shorelines." About 2 percent of the Mars Orbiter Camera images were targeted to look in places that would test shorelines proposed by others in the scientific literature. "Even on Earth, looking for ancient shorelines from the air or space is a challenge," said Dr. Michael Malin, principal investigator for the camera at MSSS. "Despite these difficulties, we believe these Mars Orbiter Camera images of the proposed shorelines are of a high-enough resolution that they would have shown features indicative of a coastal environment had there been an ancient ocean on Mars." The paper containing these new conclusions will be published in the Oct. 1 issue of the Journal of Geophysical Research Letters. 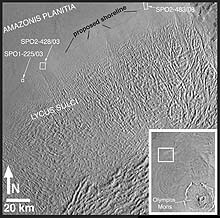 One area that might have been a coastline is located northwest of the great volcano Olympus Mons (see inset at lower right of Figure 1). Researchers looking at Viking images have suggested that there might be a cliff separating the western margin of the Lycus Sulci uplands from the lower-elevation, smoother Amazonis plains (upper left in Figure 1). The proposed cliff looked like the kind that forms on Earth from erosion as waves break against a coastline. Three high-resolution images, shown by white boxes in Figure 1, were taken of this proposed coastline. The middle section of the central image (SPO2-428/03), shown in Figure 2, was taken in July 1998. The Sulci uplands (lower half) are roughly textured, while the flat Amazonis plains (upper half) appear smoother. The image shows that the contact between the two regions is clearly not a wave-cut cliff, nor are there any features that can be unambiguously identified as coastal landforms, according to Malin. "While the suggestion that Mars at one time had oceans cannot be ruled out, the foundation for the 'ocean hypothesis' developed in the 1980s on the basis of suspected shorelines appears now to have been incorrect," Malin concluded. "However, it should be understood that there is significant other evidence of water on Mars in the past, both from Mars Global Surveyor and from previous missions. Today, the Mars Orbiter Camera continues to acquire new high-resolution pictures, each one helping to search for clues to the very important question of the role of water in the evolution of Mars."